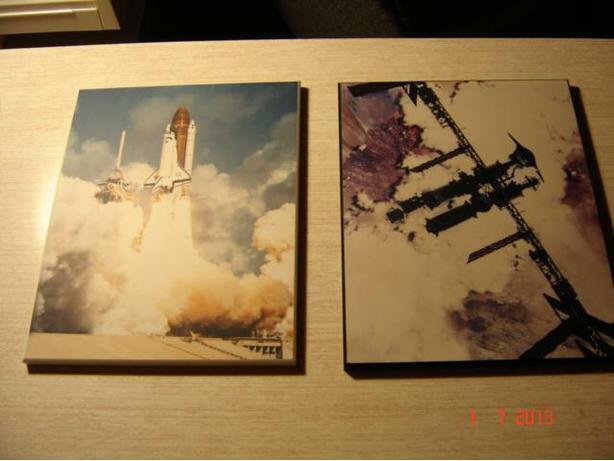 Space Shuttle Laminate Frames: Collectibles, purchase dates back to the 1980's, unknown origin artist/ photographer, both approx. 8" x 10", only sold as set. Not too many of these around! Asking only $55 (for set) or B.O. Notes: First flight (STS-51-J) 3 October 1985. Atlantis was the only orbiter (Orbiter Vehicle Designation: OV-104) which lacked the ability to draw power from the International Space Station while docked there; it had to continue to provide its own power through fuel cells.